Today, however, the sun shone with a deliberate show of late Spring/pre-Summer ferocity. 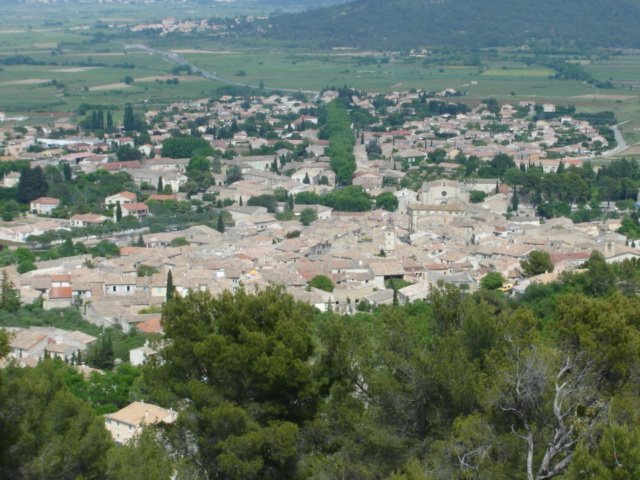 A day for sun cream, shorts and an aperitif beneath shady plane trees preferably in a small village in the Gard. 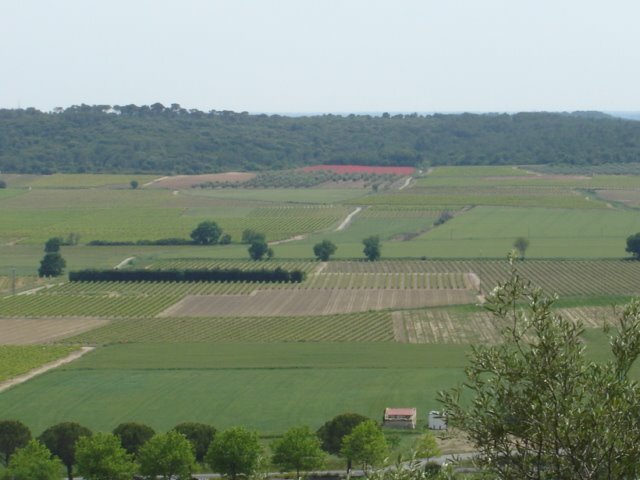 My friend and I were invited to share a cool glass of rosé in Calvisson, not far from Sommières. We were supposed to meet up the previous day for a sun-downer, but the sun never really made it out sufficiently to tell when it was going down, and anyway, I wasn't moving from my sofa for a drink in drizzle. I looked in my book of walks around Montpellier, little used since the arrival of boys, and found a 12km march in the area. Having no intention of such extreme exertion in 30°C, it looked liked we could cut it short with no real loss of face. Calvisson has a market on Sunday mornings and it was surprisingly big, taking up the whole of the main square, and rendering the Halles completely redundant, being way too small. The square was lined on three sides by giant plane trees, so the whole market was nestled in the shade and smelt deliciously of roasting chickens, cheese, and other delectable delights. We made our way to the Café des Sports and had a pleasant aperitif overlooking the commercial bustling. When stomachs started rumbling, and a certain headiness indicated evidence of drinking on an empty stomach, we headed for lunch in a café on the other side of the square and had a mediocre salad, and more wine. The weather was more conducive to a digestive snooze in the shade, but we walked, instead, up the hill towards the abandoned windmills on the top of the Roc de Gachonne. One contained the bodies of two friends, who were interred aged 71 as said a crumbling plaque set into the stone wall. Hope they were dead already! The climb had been pretty steep although we could have followed an easier track, part of a parcours de santé, a jogging path with exercises described on posts along the way. Although it was a lovely place, the path was stony and I can't imagine anyone seriously jogging along it. It must attract the Sunday softie joggers, like me, who want to do some exercise but can't stand running. This way you jog a bit then stop to swing your arms about or do press-ups, then another little jog, pull-ups, and so on. What you do is indicated on the signs at each exercise spot. It takes the decison-making out of exercising so is very popular with me. Today was not a day for jogging though, especially on a full stomach. 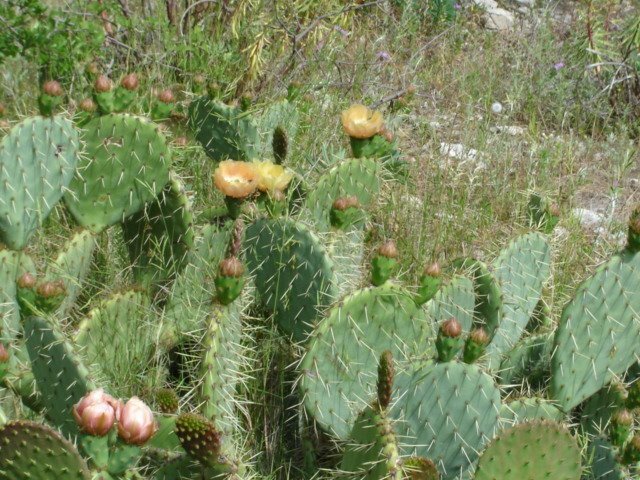 The cacti were in flower, the buzzing insects provided the only movement of air, and the still heat was definitely too oppressive for over-exertion. At the top, however, we enjoyed a light breeze, which, in days gone by would have be sufficient to send the windmill sails turning and setting the huge grinding stones to work. 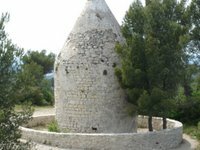 The view was described on top of one of the windmills by a point de repère installed in 1911 which told us, usefully, how far away Perpignan is (188km), Sommières, Tunis, and so on. You never know when such information will come in handy... 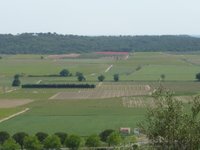 The extensive river plain stretched out below, with parcels of vines, tilled earth, fields of poppies, olive trees and houses. The old rail track has been pulled up and turned into a super flat cycle path to the joy of cyclists of all ages. No fear of being mown down by a drunk driver or sleepy truck driver there. The book of walks has reminded me that I must take the boys to see the Roman road of the via Domitia near Lunel. There is a walk there you can do, by bike if you wish, and takes you along the cobbled roads built by the Romans (or their slaves) with an encampment (Ambrussum) and ruined bridge. If we take the swords and other weaponry, together with a picnic, they should enjoy a bit of eddikashun without realising it. Some great photos there. Thanks Peter!